A surprise hug from Rahul Gandhi in parliament on Friday did nothing to soften Prime Minister Narendra Modi's return fire hours later during a debate on the opposition-backed no-confidence motion against his government. PM Modi's stinging point-by-point rebuttal did not spare either Congress president Rahul Gandhi or his mother Sonia Gandhi. "In the morning, the voting was not over, the debate was also not over, one member comes running to me saying - Utho Utho Utho (up, up, up). What is his hurry to come to power? Let me tell this member it is the people who elected us. That is how we have come here," PM Modi said in what was seen as his barb at Rahul Gandhi. He also mimicked Rahul Gandhi's wink after the hug, using his hands, and pummeled him with the phrase: "Bachkani harkat (childish antics)". Earlier on Friday, Rahul Gandhi had stunned everyone when he crossed the floor and hugged PM Modi, declaring that he felt nothing but love for him. The Prime Minister had remained seated as he called the Congress chief back, pulling him by his sleeve, said something to him and patted him. Just before that exchange, Rahul Gandhi had launched a sharp attack on the PM over the Rafale deal and also said: "You can't look me in the eye." The Prime Minister ripped into that comment and every other dig that Rahul Gandhi made. "Who are we to look you in the eye? I am from a humble family, you are naamdaar, we are kaamdar. We don't have the guts to look you in the eye," said PM Modi, using the comment to drive home his point that the Congress had always been a bully. "Look what happened to people who tried to look you in the eye. They were humiliated...Charan Singh, Sardar Patel, MorarjiDesai, Chandra Shekhar, Sharad Pawar..."
As he dwelt on the theme of Congress arrogance, he even reminded Sonia Gandhi of her famous comment in 1999, when the Congress moved a no-confidence motion against the Atal Behari Vajpayee-led NDA government: "We have 272 and more are coming." Referring to the former Congress president's latest comment, on today's no trust vote, he said: "I read in the newspaper, they said 'who said we don't have the numbers?' Such arrogance." PM Modi also rebutted Rahul Gandhi on his "jumla strikes" and "bhagidar" (collaborator) and not a 'chowkidar (watchman)" comments. "Yes, I am bhagidar, but not thekedar (middlemen) like you," he said. He lashed out at Rahul Gandhi over his Rafale allegations, saying: "We must refrain from making childish statements on sensitive issues. There was an agreement between two responsible governments. Because of one careless allegation in the House on Rafale, two nations had to release statements." 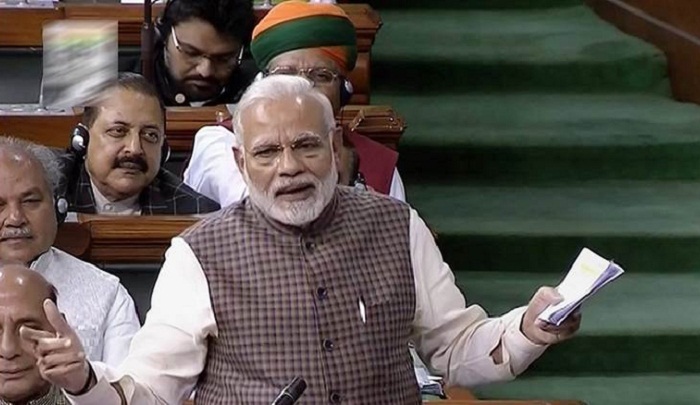 After PM Modi's speech, that went on for an hour and a half, the government was able to easily defeat the opposition-backed no-confidence motion 325-126. 451 members were present in the Lok Sabha and the half-way mark was 226.